The part of my book set in Brooklyn takes place in 1976, so going there now was never going to be enough. I’ve had incredible luck connecting with Brooklynites who remember it ‘back in the day’. One example: Big Apple Greeters is an association of volunteers who give up their time to show visitors around New York; they’re not professional tour guides, but locals who know the place inside out. 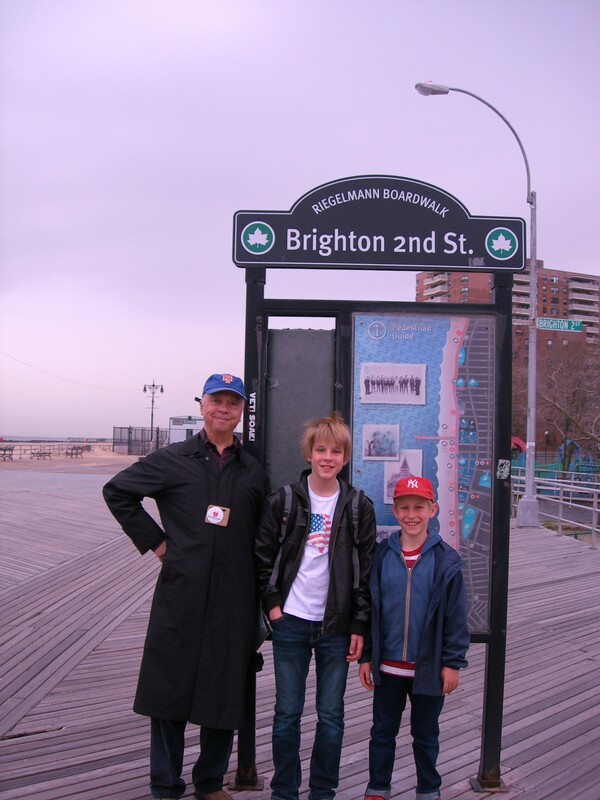 Last April, my sons and I hit the jackpot when we were chosen by Clyde Turner and had a lot of fun exploring Coney Island and Bay Ridge with him. Having practised medicine for many years in the neighborhoods I was interested in, Clyde has proven to be a wonderful expert to have on my ‘home team’. Since the weather was awful that day and I haven’t seen Coney Island as it should be seen in high summer, I’m very grateful to another of my Brooklyn friends, Tony Catalano, for allowing me to use some of his photos here. Tony’s amazing record of Brooklyn through the decades (especially the 70s) has been a major inspiration to me and if you click on any of his pics here it’ll take you to his collections on flickr.com. OK, first off, Coney Island isn’t an island, at least not any more. It’s at the southern end of Brooklyn and was originally the westernmost of the Long Island barrier islands until the channel was filled in permanently before WWII. Like so many place names in Brooklyn (originally Breuckelen) it derives from the Dutch settlers who dubbed it Conyne Eylandt after the many species of wild rabbits they found there. Apart from its proximity to Manhattan, the main reason Coney took off as a beach resort is that it faces due south and gets the sun all day long. It has an continuous sandy beach and boardwalk two and a half miles long, which you can see in the photo with my boys in it, and comprises four distinct neighborhoods, Seagate, Coney Island, Brighton Beach and Manhattan Beach. 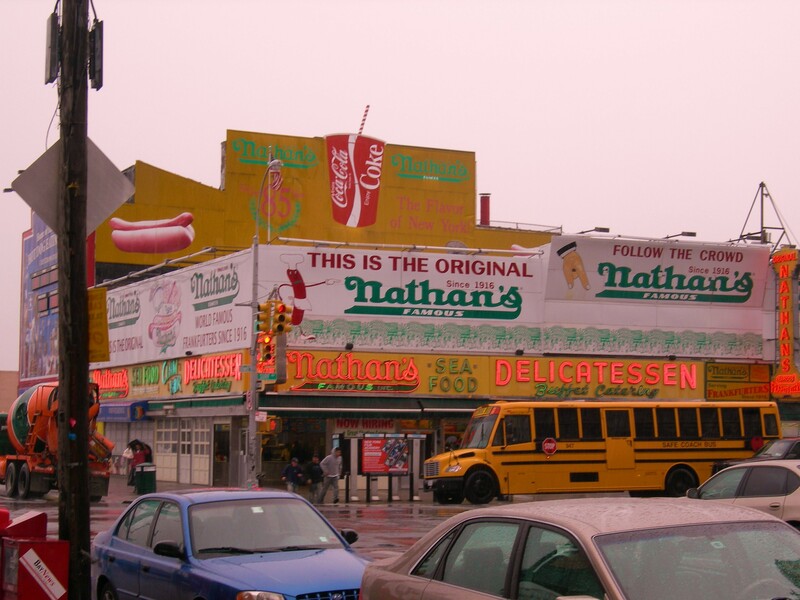 Another lasting local delight is Nathan’s Famous hotdogs, founded in 1916 by Polish immigrants Nathan and Ida Handwerker and a true ‘American Dream’ story, going from a small stand to what can justly be described as an institution. Eating hotdogs here was the high point of our day with Clyde (who gets to do it on a regular basis, lucky guy), even though in bad weather there is nowhere to sit. There’s a strongly-worded sign forbidding women from entering the men’s bathroom (wonder what that’s all about ?!) Nathan’s is heaving all year round and some say the area would be doomed without it, not that there seems to be any danger of that happening. During my research I was really struck by how attached Brooklynites are to their neighborhoods and how nostalgic they are for a time when people were content with simple pleasures close to home. Both those who’ve moved away (and many who left as children in the 70s when it was pretty troubled didn’t return) and the ones who never left talk with great affection of family days out and bunking off high school at Coney Island. 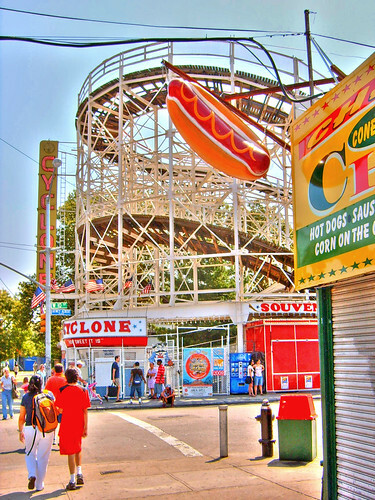 There’s no doubt that it faces a very uncertain future, but actually, Coney Island has always attracted controversy and in true Brooklyn style, its supporters aren’t giving up without a fight. I think it’s an important piece of NY heritage that tells a colourful story about how times have changed, and I hope it can hang onto some of what made it special. We would love to go back in the season and experience the Friday night fireworks or the annual Mermaid Festival which is hugely popular and to judge by Tony’s pictures, very entertaining. My younger son and I will be back in Brooklyn this year around Halloween and we can’t wait to see our friends again, discover new things and eat more of Nathan’s Franks. Oh no, I’ve just had a thought. The rollercoaster will be still be open then. Looks like I just ran out of excuses…. 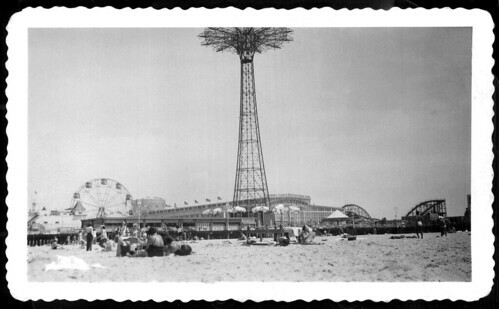 Do you have a Coney Island tale of your own? Or have any of your favourite places (almost) disappeared? « Book Groups – What’s Your Story? Hi All, it feels like bad form to be the first to comment on my own post but I hope you’ve spotted the deliberate mistake – the Brooklyn Bridge opened in 1883 not 1903. Being familiar with this fact I can’t think what possessed me to get it wrong (maybe doing it on my hairdresser’s laptop didn’t help) but every time I try to correct the date WordPress deletes half the post. The technical frustrations of the last few days have been beyond belief! Please excuse me.